For one to have invented invisible lightning, a stethometer, and even an insomnia germ, this individual must have been a scientific genius or wizard. In fact, there was such a person; his name was Peter Quill. Known as The Crimson Wizard, Quill's exploits originated at WGN and were aired over the Mutual Network. Previous research of this series has been limited because to date, no scripts or recordings have been located; and the notion that the program aired for only one season, 1940-41. A 1997 article by Bill Kiddle that appeared in Chuck Schaden's Nostalgia Digest reported that Marvin Mueller played the lead with support from Alice Hill, Ken Griffin and Olan Soulé. Although the plots were bizarre, the inventions incorporated into the stories were all based upon scientific fact. This program information was gleamed from the radio columns of the Chicago Tribune, owners of WGN. An October 1940 review in TIME indicated that the program had returned to the air after a summer hiatus. It was this clue that lead to the discovery of not one, but two additional seasons of the spy-thriller, melodrama. 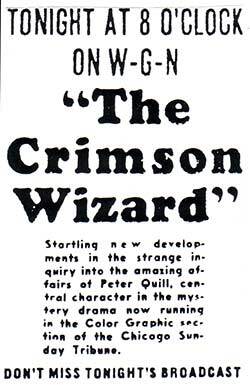 Readers of the Color Graphic Section of the September 25, 1938 Chicago Sunday Tribune were enticed to listen to WGN at 8:00 p.m. the following Friday for the initial installment of The Crimson Wizard. The program was to feature the adventures of Peter Quill, a hunchback who used his scientific ingenuity to defend America against a Communist spy ring, The Red Circle. A unique aspect of this series was that the events of each episode were aired "live" over the radio and "permanently recorded" in the newspaper the following Sunday. This documentation was the result of the program's creators, Robert M. Lee and Blair Walliser who were at the time, Chicago Tribune Managing Editor and WGN Program Director, respectively. The first season ran twelve weeks and starred Hugh Studebaker, one of Chicago's radio soap opera veterans as the lead. Maida Travers played by Donna Reade was a vocalist whose singing inspired Quill to give purpose to his life. Born a frightful hunchback, Peter Quill never ventured outside his laboratory. His discovery of invisible lightning involved him in a plot against The Red Circle to recover stolen battleship plans. The blueprints were drawn by naval architect, Eric Lambert (Olan Soule). The investigation was lead by Secret Bureau Chief Allan Tyler (David Gothard). Members of The Red Circle included: Sonya Danilo (Irene Lorraine), Michael Raclov (Leslie Spears) and Comrade Petrovich (Henry Saxe). The story begins in Washington, DC with the theft of the plans. The action moves to New York and the Jersey Coast, then across the Atlantic to the British Isles. The final showdown occurs in the Mediterranean Sea with a treasonous Peter Quill on a Red Fleet battleship. How did he get there? Was he a traitor? This was all a clever ruse to deceive The Red Circle who wanted him to use his invisible lightning against the free world. The program with the title simply, Peter Quill, resumed just a few weeks later with the second series commencing Friday, February 24, 1939. Once again, the focus was thwarting the insidious Red Circle. Hugh Studebaker continued as the lead. Quill was assisted by his friend, Sharon (Betty Lou Gerson) to whom he confided that he had survived a terrific explosion aboard a Red Fleet vessel and was no longer a hunchback. The second season lasted twenty weeks and featured many of the same characters (and cast). Several new inventions of The Crimson Wizard were introduced and used throughout this season. The most significant of these was thermion, a substance that could generate intense heat and be incorporated into devices of various shapes and sizes. Other notable gadgetry included: silent anaesthetic pellet gun, thermoradiant condensator, electromagnetic force gun, and a delayed-action explosive. Quill's pursuit of The Red Circle took him from Coast to Coast and also to various islands off the Atlantic Seaboard. It was in Havana that Quill acquired the assistance of the romantic team of Gail Carson (Alice Hill) and Captain Roger Dorn (Ken Griffin) both members of the Secret Bureau who would continue their vigilance throughout this and the following 1940-41 season. The third and final season which began on Sunday, October 6, 1940 featured Marvin Mueller as Peter Quill. Mueller, a talented actor was also heard during the week in various roles from Santa Claus, and the Mutual Monikers quiz show emcee, to commentator for Chicago Opera broadcasts. Quill continued his fight to destroy The Red Circle with his latest inventions: stethometer, electric bullet and a cerebroscope. Experiments with various chemicals availed him to control extreme cold and devastating fires. His travels took him to the far reaches of the African jungles where his adversaries were not only spies but black panthers. The Chicago Sunday Tribune ended its full page Graphic Section coverage with the 1939 season. Thus, there is less information of the 1940-41 season available to OTR historians. Moreover, to compound problems, not all geographic editions of the Chicago Sunday Tribune (as well as other newspapers) included program publicity in their respective radio columns. With each season, Peter Quill was heard on an ever-increasing number of stations. Of special note is that the program was only aired during 1941 in New York. WOR featured Peter Quill as part of it's daily 3 O'Clock Playhouse. Each day, a different program was broadcast in this afternoon slot. Some of these other programs included: Lew Loyal, Mystery Hall, Ned Jordan-Secret Agent, and The Green Hornet. Produced from various Mutual outlets, they could not be aired at their original time because of scheduling conflicts at WOR. Perhaps WOR recorded Peter Quill on ETs each Sunday as it came over the wire from WGN? This is one hope that an episode maybe found in the future. Another possible opportunity to chance upon a transcription may have come as a result of the program aired on a non-Mutual station. 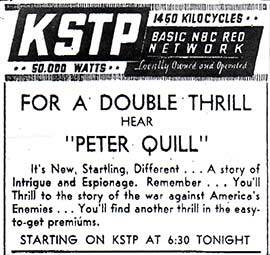 During the first half of the 1940-41 season, listeners in the Minneapolis-St. Paul area tuned in the local Mutual outlet-WLOL on Sunday afternoons to hear Peter Quill. Starting on Monday, January 6, 1941, the program was broadcast at 6:30 p.m. over KSTP, the NBC-Red affiliate in that market. How did KSTP negtiate to air the program? Did this station record it directly from Mutual, or were ETs provided from a syndicator? A most intriguing item is that KSTP promoted "easy-to-get" premiums associated with the program. As none of these are mentioned in any radio premium book, it's unknown if these were rings or perhaps a miniature stethometer. Were they offered on a Nation-wide basis or solely through KSTP? Was a sponsor involved? During the first two seasons, the program was a sustainer over Mutual. By the third season, the Paul F. Beich Company was sponsoring the program promoting its Whiz Candy Bars. The ad agency handling the account was N.W. Ayer & Son, Inc. The archives of these companies may provide additional information on the premiums and other aspects of the program. Production costs of only $800 per week were expended for each episode. This was similar to the $850 for Inner Sanctum Mystery, but much less as compared to The Shadow ($1,600) and Mr. District Attorney ($2,800). The standard OTR reference books note that the opening signature was produced by having Marvin Mueller "wail into the strings of a piano while the sostenuto pedal was held down," a most unusual effect. How were sound effects made for the invisible lightning, radiosonic compass and other inventions? The artist performing these amazing feats was Russell Raycroft who was required to work behind a screen per the orders of Director Blair Walliser. Thus, even the 600 who attended the weekly performances left the studio wondering how the unique sounds were accoplished. Moreover, the audience enjoyed the live music provided by the WGN Concert Orchestra under the direction of Henry Weber. Created by: Robert M. Lee & Blair Walliser; Writer/Producer/Director: Blair Walliser; Sound Effects Artist: Russell Raycroft; Music: Henry Weber Conducting WGN Concert Orchestra. September 30, 1938-December 16, 1938. WGN and other Midwest Mutual stations only. CAST: Hugh Studebaker (Peter Quill), Donna Reade (Maida Travers), David Gothard (Allan Tyler), Olan Soule (Eric Lambert), Irene Lorraine (Sonya Danilo), Henry Saxe (Comrade Petrovich), Leslie Spears (Michael Raclov). September 30, 1938 "The Crimson Wizard"
October 7, 1938 "Murder in the Dark"
October 14, 1938 "Drama at Sea"
October 21, 1938 "Atlantic Flight"
October 28, 1938 "Radio Warning"
November 4, 1938 "Peter Quill Escapes"
November 11, 1938 "Thunder Over London"
November 18, 1938 "Escape from The Reds"
December 2, 1938 "Armada of Death"
December 16, 1938 "Veil of Mystery"
February 24, 1939-July 7, 1939. WGN and other Midwest Mutual stations; various days and times on West Coast, Don Lee Network. CAST: Hugh Studebaker (Peter Quill), Betty Lou Gerson (Sharon), Olan Soule (Allan Tyler), Reese Taylor (Stephen Blade), Irene Lorraine (Sonya Danilo), Henry Saxe (Comrade Petrovich), Leslie Spears (Michael Raclov), Alice Hill (Gail Carson), Ken Griffin (Captain Dorn), with Bob Barron, Clare Baum, Frank Behrens, Charles Calvert, Kay Campbell, Fran Carlon, Ken Christie, Leo Curley, Frank Dane, Patricia Dunlap, Chris Ford, Murray Forbes, Genelle Gibbs, Dolores Gillen, Stanley Gordon, Hilda Graham, Percy Hemus, Doug Hope, Barry Hopkins, John Larkin, Burr Lee, John Matthews, Don Merrifield, Bob Middleton, Marvin Mueller, Vernile Murrin, C. Henry Nathan, Herb Nelson, George Noise, William Rath, Olga Rosanova, Wally Seitz, Dan Sutter, Arthur Van Slyke, Peggy Wahl, John Walsh, Sam Wanamaker, Duke Watson, Joan Winters, Leslie Woods. February 24, 1939 "The Return of Peter Quill"
March 3, 1939 "The Red Circle's Cruel Trap"
March 10, 1939 "The Red Circle Grasps for 10 Billion Dollars"
March 17, 1939 "Red Ghost of Washington"
March 24, 1939 "Red Dawn Over Panama"
March 31 1939 "Red Rain of Death"
April 7, 1939 "Under the Red Mask"
April 14, 1939 "The Red House of Terror"
April 21, 1939 "The Captain Conquers Death"
April 28, 1939 "The Riddle of The Red Imposter"
May 5, 1939 "Detour to Doom"
May 12, 1939 "The Revenge of The Red Circle"
May 19, 1939 "The Isle of Terror"
May 26, 1939 "Attack and Counter-Attack"
June 2, 1939 "The Phantom Ship"
June 9, 1939 "The Spy School"
June 16, 1939 "Caught in the catacombs"
June 23, 1939 "The Devil's Work"
June 30, 1939 "The Red Sunset"
July 7, 1939 "Deep Sea Death"
October 6, 1940-March 30, 1941. WGN and most of the Mutual Network, sporadic coverage on East Coast. Sponsored by Paul F. Beich Company for Whiz Candy Bars. Produced by N.W. Ayer & Son, Inc. (Advertising Agency). CAST: Marvin Mueller (Peter Quill), Alice Hill (Gail Carson), Ken Griffin (Captain Dorn), Olan Soule (Allan Tyler), Irene Lorraine (Sonya Danilo), Leslie Spears (Michael Raclov), with Louise Fitch, Jim Goss, Ann Kuper, John Walsh. October 6, 1940 "The Thing That Couldn't Happen"
October 20, 1940 "The Child Giants"
October 27, 1940 "The Phantom of The Navy"
November 3, 1940 "The Creeping Plague"
November 17, 1940 "Flight Without Wings"
November 24, 1940 "Red Devil of Catamount Ridge"
December 1, 1940 "Sigma Ray"
December 15, 1940 "The Frozen Terror"
December 22, 1940 "The River of Flame"
January 5, 1941 "A Night of Terror"
January 12, 1941 "Case of The Convivial Corpse"
January 19, 1941 "Devil's Magic"
January 26, 1941 "Death After Dark"
February 9, 1941 "An Eye for an Eye"
March 9, 1941 "All Roads Lead to Madness"
March 16, 1941 "Life After Life"
ABOUT THE AUTHOR: Karl Schadow has been researching and writing about the Golden Age of Radio for 25 years and specializes in mystery dramas, especially The Shadow. He has several hundred programs in his personal archives as well as hundreds of books, scripts and magazines. You can e-mail Karl at bluecar91@hotmail.com or write: PO Box 1031, Sandston, VA 23150.